Stacey Carmichael, who marched with the Allegiance Elite (Calgary, Alberta) from 1994 to 1999 and with the Blue Knights from 2000 to 2002 (and is now on the brass staff with Allegiance Elite), sent this one in. 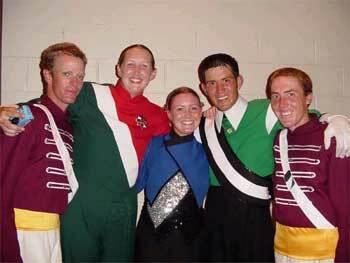 "I took this picture at the 2003 finals, since these are all people I marched with at the Blue Knights in 2002. They moved on to other corps for the 2003 season. They are (from left to right) Sean, Laura, Jillian (yay!) Ivan and Scott. They all aged out this past year! See everyone in Denver 2004!" Thanks Stacey!